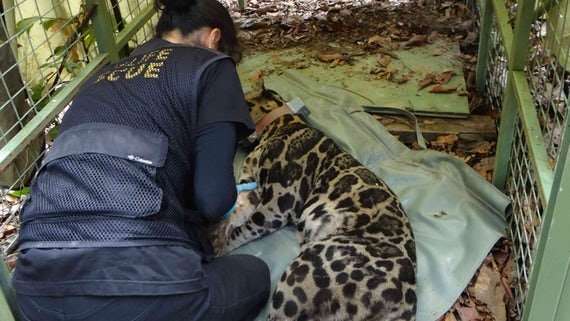 Satellite collars have provided researchers in Borneo with a new insight into the mysterious movements of the Sunda clouded leopard, helping to ensure the future of this vulnerable species. The international team, including researchers from Cardiff University and the Danau Girang Field Centre, tagged four leopards with satellite collars and investigated what factors influence their movements through the landscape, and explored how future landscape change scenarios might affect them. Dr. Andrew Hearn, from Oxford University Wildlife Conservation Research Unit, said: "We found that forest canopy cover facilitates the movements of these cats through the landscape, but that recently cleared or underproductive and flooded oil palm plantation areas tended to resist their movements. "Our study provides the first evidence that forest cover is crucial to maintain the connectivity of clouded leopard populations, and highlights that the protection of the large areas of privately owned forest in the Kinabatangan, much of which is earmarked for conversion to plantations is critical for their survival in the region." By tracking the elusive predator, the collaborative research aimed to influence policies to help with the conservation of the Sunda clouded leopard – one of the largest predators in Borneo. Dr. Benoit Goossens, Cardiff University and Director of the Danau Girang Field Centre, said: "Our research showed that the conversion of frequently flooded and underproductive plantations areas to forest would bring large benefits to Sunda clouded leopards, whilst minimising impacts to the plantation industry. "We predicted that the reforestation of narrow forest corridors may be an important and cost-effective conservation tool for this species. "These findings will be integrated in the State Action Plan for the Sunda clouded leopard that is currently drafted and will be launched in September 2018." Dr. Samuel Cushman, Director of the USDA Forest Service Center for Landscape Science, said: "The analysis produced a very clear finding that clouded leopards are highly resistant to moving outside of forest cover and the scenario analyses provide clear and useful guidance to managers about the costs and benefits of alternative conservation planning in the Kinabatangan region."